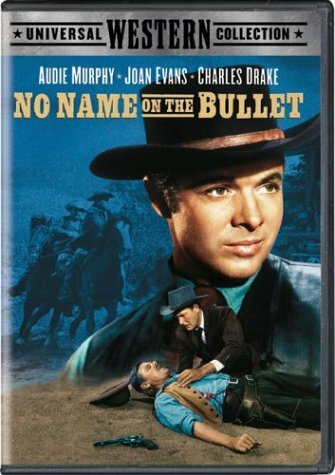 Audie Murphy is superb as mysterious hired killer John Gant in an excellent psychological Western, NO NAME ON THE BULLET. Gant rides into town and checks into a room above the saloon, then proceeds to sit around drinking coffee and playing chess while various guilt-ridden townspeople go crazy due to the presence of a hired killer in their midst. 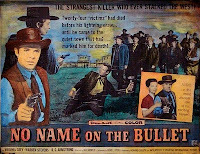 Before long one man has killed himself, another prepares to leave town, and some of the townspeople have engaged in a shootout amongst themselves. Gant, meanwhile, bides his time before paying a visit on his unlikely quarry. This movie reminded me, of all things, of the classic 1958 MAVERICK episode "Shady Deal at Sunny Acres," where James Garner's Bret Maverick sits on a porch whittling and saying "I'm workin' on it!" while others are actually busy righting the wrong that was done to him. I couldn't help thinking of that as Gant sat quietly ordering more coffee, while the townspeople fell to pieces around him. Gant may be a hired killer, yet he leaves the town a better place, with many of the changes occurring while he sits and watches. Gant engages in philosophical chats with the town doctor, Luke Canfield (Charles Drake), whom Gant calls "Physician." Their exchanges are some of the best scenes in the movie, as they discuss matters of life and death. Gant admires Luke as an honest man and tries to convince Luke that perhaps their roles are not as different as Luke thinks. Murphy is simply excellent in every way as the steely killer. He's well aware of the chaos his presence causes and takes a certain amount of satisfaction from it, particularly if fear inadvertently leads the guilty to some form of justice; at the same time, Gant is highly self-disciplined, refusing to gun down the honorable sheriff (Willis Bouchey) he wasn't paid to kill. 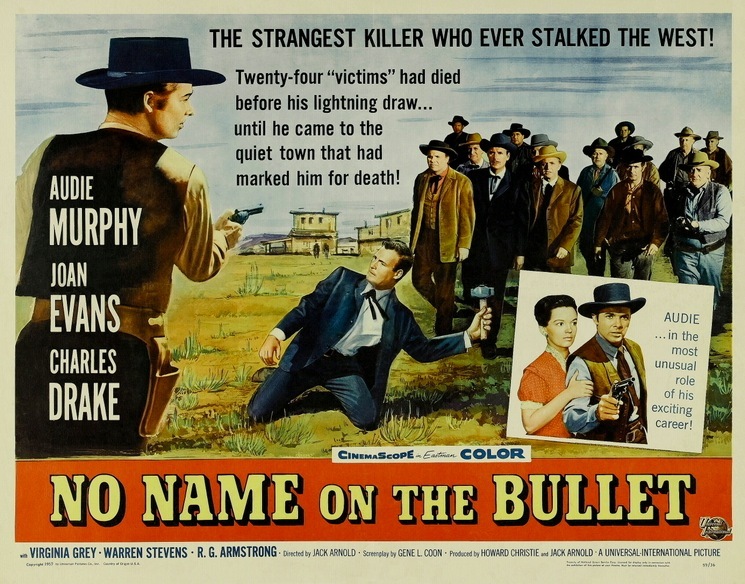 It's a very assured, confident performance by Murphy; having seen several Murphy films this year, it's interesting tracing his development from a slightly awkward yet fitting performance in SIERRA (1950) to the pitch-perfect acting of later films like NIGHT PASSAGE (1957) and NO NAME ON THE BULLET. 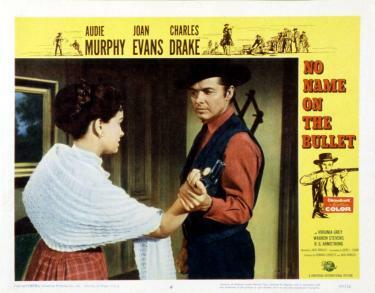 Drake is also fine as the doctor concerned about the state of his community's health as they react to Gant; Drake was always a reliable "go to" actor, particularly when it came to playing noble types, FOUR GUNS TO THE BORDER (1954) being but one more example. I thought the casting of R.G. Armstrong as Drake's father was a bit odd, and indeed, a peek at IMDb shows that in real life Armstrong was just six months older than his "son." Both men were born in 1917. Drake had been in the movies for two decades at this point, with one of his earliest films being THE HUNCHBACK OF NOTRE DAME (1939); Armstrong's first film wasn't until 1954. Offscreen Armstrong outlived Drake by many years; Drake died in 1994, while Armstrong was still with us until last summer, passing away in July 2012, at the age of 95. Joan Evans plays a judge's daughter who's Luke's fiancee, but it's a bland role and performance; her character seems to exist mainly to serve as a plot device late in the film. Virginia Grey, seen last night in THE FIGHTING LAWMAN (1953), probably filmed her scenes in a single day, but she's highly effective as a woman who knew Gant in the past. Warren Stevens plays her disturbed husband. This storyline seems somewhat truncated; it would be interesting to know if some of it ended up on the cutting-room floor. The cast also includes Karl Swenson, Jerry Paris, Whit Bissell, Edgar Stehli, Marjorie Bennett, and Hugh Corcoran. Cowboy actor Bob Steele is a poker player. The movie was directed by Jack Arnold (CREATURE FROM THE BLACK LAGOON). It was shot on the Universal backlot by Harold Lipstein. The film runs 77 minutes. 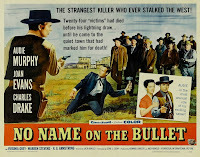 NO NAME ON THE BULLET is available on DVD in a widescreen print from the Universal Western Collection. 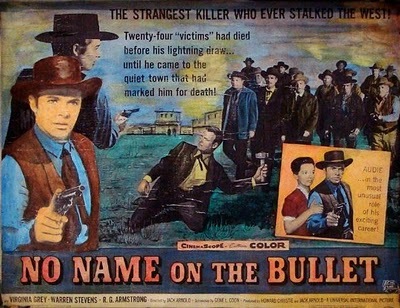 It was also released in the Universal Western Collection VHS series. 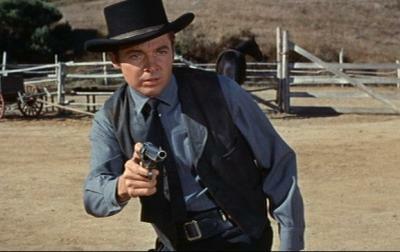 Previous reviews of Audie Murphy films: SIERRA (1950), GUNSMOKE (1953), RIDE CLEAR OF DIABLO (1954), and NIGHT PASSAGE (1957). 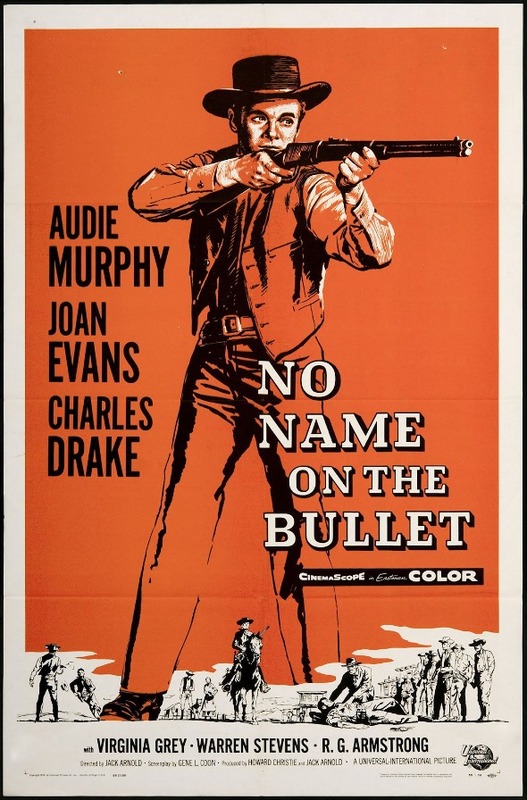 Terrific movie, and an equally terrific performance by Murphy. His role in Huston's The Unforgiven maybe just surpasses it, but not by much.